Not everyone finds it easy to make friends. Sometimes gay or bisexual people, particularly younger people but also some older people, struggle with making friends and getting to know others. Pop psychology throws us these expectations to have ‘personality’ and ‘self esteem’, to be ‘self-actualized’ or ‘cool’ and to be ‘normal’ (whatever that means!) and not have ‘issues’ or ‘baggage’. Sometimes these expectations can lead us to hide who we really are from others. And this in turn can leave us feeling alone or misunderstood. Being ourselves and being accepted for who we are can help us to feel good. 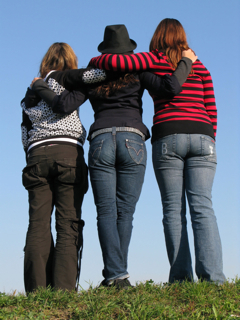 Finding and making friends with others can help us to feel better about ourselves. But shyness can get in the way of getting to know other people. Here are some ideas about how to meet people, make friends and deal with shyness. Generally people make friends through work, family, through other friends, over the internet and by ‘going out’, socialising on our own or with others. Whether we realise it or not, we are constantly crossing paths with other gay and bisexual people who might share our interests! It can be useful to make a list of the sorts of things that interest you and that you like to do. Knowing who you are and what you like is a good starting point for building friendships. It means you can work out where to look for other gay or bisexual people who might share your interests. For example you might really like playing tennis and enjoy going to the cinema. Or maybe you are into fishing and buying collectables on ebay. Gay people have all kinds of interests and there will definitely be others out there who share yours. What are your expectations of friendship? We can have all sorts of ideas about what a friend should be and how they should treat us. Another question is, what sort of friend are we going to be towards other people? Remember others can find it difficult to make friends as well. If Shyness has been a part of your life for some time, it is probably not about to suddenly pack up and leave. What kind of relationship have you had with Shyness in the past? If Shyness continues to be around, what sort of relationship would you like to have with it? What purpose does Shyness serve in your life? In re-assessing your relationship with Shyness, maybe you will decide to strike a deal with it, manage it differently or take more responsibility for it. These are things you can speak with a gay counsellor or therapist about. Several counsellors were asked to provide tips for making friends. Here were their top responses. Talk to people. No one makes friends sitting alone in front of the TV. Engage with other people in person or over the net and see what happens. When you meet someone face to face, try making eye contact and smiling. It might be hard at first but when you start to practice it, it will get easier. Try to be reliable and trustworthy. If there are qualities you admire in others then put them into practice yourself. You will probably start to attract people! Be open minded but don’t compromise your values. Everyone is different so you are going to be surprised and perhaps shocked by the people you meet. You can accept others and be open to new experiences without having to sacrifice what is really important to you. Some of the best advice comes from those old sayings we hear time and time again. “You can’t buy friends”. “Be yourself”. “Don’t be a doormat”. You are likely to have some useful knowledge about how to make friends already! This entry was posted in Gay and Lesbian, Sexuality, Shyness and tagged acceptance, baggage, counselling, counsellor, friends, friendship, personality, psychology, self-esteem, shyness, therapist, therapy, trust. Bookmark the permalink.